"War had taken to the skies and America was now involved." Girl with a Star Spangled Heart, the true story of Betty Nugen, a small-town farm girl who joined the Women's Army Corp to serve in World War II. This is a story of true American heroism, family, patriotism, and honor. Written with love and passion by Betty's daughter, Elaine Fields Smith. The book is beautiful crafted, with fun, witty dialogue, moving memories, and lo and behold, even a bit of romance, which was so beautiful, considering how long Betty waited for the right man, Glenn Fields. This is a book that everyone needs to read. In a time of political corruption, distrust, and polarization, in a time of celebrity worship and idolizing women for looks alone, Girl With A Star Spangled Heart is a wonderful reminder that a woman is so much more than physical beauty. Betty Nugen is the role model that I didn't even know I was looking for. She's courageous, honorable, intelligent, strong, patient, and she follows her heart and her calling to the bitter end. She is a role model for the generations, and especially for the young women today who are told that we are worthless unless we're pretty, unless we're married, unless we're a size two, etc… Thank you, Ms. Smith, for sharing your mother's extraordinary tale with us. It is one that I will not soon forget. 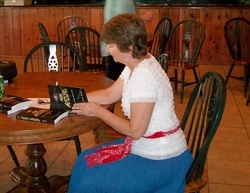 Live music, ice cream, friends and my new book all came together on 3/9/13 at the Stephenville Dairy Queen. Richeson DQ of Texas hosted, provided publicity and free dipped cones for every book purchase. Music by Casting Caroline provided a great atmosphere and the many visitors displayed lots of smiles. Why the Dairy Queen for the event? Because one of the bad guys in the story was arrested in that very Dairy Queen in 1988. This DQ also stars in my first book, Ridin' Around, as the anchor for the west end of the "drag" and where I met my husband of, now, 30 years. this all took place and it was spooky! Read this, you won't be disappointed! Ms. Smith's book is well-written, interesting...and scary. commands his entourage with sheer terror, causing them to do unspeakable things. This thriller is based on a true story that profoundly affected a small town and county. The author has researched court documents and written scores of letters to piece together this story that opens in 1988 and continues to the present day. Flashbacks fill in the details of bad decisions and lives lost. easy to make money doing a little "dealing." Unfortunately, it doesn't stop there. The big city and big time dealing are too tempting. The heavier drugs, beautiful women, all night parties, and wads of money are intoxicating. bullet in their back; it was threats against their families back home that caused them to follow orders, no matter how vile. A true crime story that will curl your hair; the senseless and gruesome murders remind one of the cruelty of a Saddam Hussein. It is just as well that most of the names have been changed. the wrong people leads to a very dark path. A must read. that stand out, and that readers enjoy, are selected for this status. "The Journey-Chapter 1 of The Perfect Place" will be listed in the category listings. It will be considered for our all time best status when it receives more than twenty-five reviews. Thank you for this addition to FanStory.com. Ridin' Around--Tailights in Chrome, 8-Tracks on Wheels is an awesome trip that anyone who came of age in the late 70's early '80s will want to read. Elaine Fields Smith sincerely and poignantly brings alive memories so spot on as well as universal stories that stand the test of a time for college students in those magic moments of the waning 20th century. Learning life lessons while driving fast and feeling the wind through your fingers held out the open window were part of every day life. 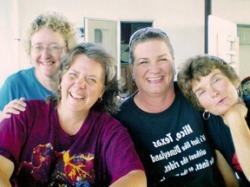 The road Glenda, Tanya, Janie and others take as they complete college are full of unforgettable highs and lows of friendship and love and growing up in a period not often written about, but worthy of these memories. Smith recalls the truths of those times in a way only an observant, honest and genuine storyteller can bring to life over 30 years later. She easily brings readers right back to a time when Camaro's, Corvettes, Thunderbirds, TransAm's and pick ups were as important to a teen's life as their friends. And music was all the more memorable and remarkable because of a new-fangled technology called the 8-track. It "was wonderful to have mobile music at your fingertips" the girls of Central Texas University recall.Dairy Queens and Taco Bells, Boz Scags and Otis Day and The Knights, love that deepened slowly, all in good time, life lessons from families where troubles ran deep, and the special relationships shared with dads and their daughters who were growing up--all of that is part of a decade that was at once happily naïve, kinder and easier than the life of today's college kids. My kids, many young men and women whose parents grew up exactly as Smith captures--they wouldn't go wrong gifting their parents with Ridin' Around--Tailights in Chrome, 8-Tracks on Wheels by Elaine Fields Smith. We'll be remininiscing forever! Elaine Smith's Ridin' Around - Taillights In Chrome, 8-Tracks On Wheels is an easy cruise through a small Texas college town where Main Street doubles as Memory Lane. Told from the perspective of a close-knit giggle of co-ed girlfriends, Smith escorts us through a poignant semi-autobiographical replay of life in 1980, when muscle cars and loud music rule the social scene, and friendships and rivalries flow with the traffic from drive-ins to dormitories and back again. This self-published novel, a first effort for Smith, belies the stereotype of the weekend vanity writer, revealing instead a gifted storyteller who carries her readers through a time and place where cold beer and Dr. Pepper are served up to go with a thick slice of nostalgia, and the most difficult part of living comes from the uncertainty of growing up. (REAL NAME) This review is from: Ridin' Around (Paperback) Remember those teen years and cruising the strip in hot rods or fancy new cars, seeing who had the noisiest engines or could go the fastest? 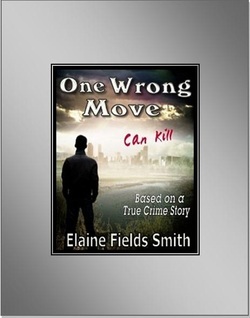 I do and so I was thrilled when Elaine Fields Smith wanted to send me her book to review! Oh my gosh I think I love this woman! Truly a writer after my own heart. Reading Ridin' Around Taillights In Chrome, 8-Tracks on Wheels just brought back so many good memories for me. A wonderful book that any Baby Boomer is sure to love. Elaine Fields Smith Author of Ridin Around. Elaine brings us back to the nostalgic days of small town America in 1980 when Saturday night on the drag strip was the thing to do and the place to be seen. Of course gas was a lot cheaper then so cruising the drag didn't cost much. Back to days of hamburgers and fries that melted in your mouth, and the music made you want to jump up and dance! Back to good friends you thought you would know forever. Trying to avoid the cops. Through all the experiences that were sometimes hilarious and often just broke your heart. Going to the drive in to see movies like The Jerk with Steve Martin. Each and every page was sheer joy to read and I know you're going to love this book as much as I have. Loved it. Brought back memories of my High School days, October 28, 2010 By CRenteria - See all my reviews This review is from: Ridin' Around (Paperback) I absolutely loved the book and the story it told. It's fun and lighthearted. It made me remember how much fun I used to have in High School cruising through town on Friday and Saturday night. I also loved getting to know her friends through the book and some of the other people she told about as well. I've known the author for several years, both her and her husband and yes they can be very corny sometimes but we always had great fun. I can almost hear her saying some of the things she said in the book. She did a fantastic job of telling the story and I couldn't wait to read more to find out what happened next. I look forward to maybe a second book coming out. Awesome job. Two thumbs up E!!! 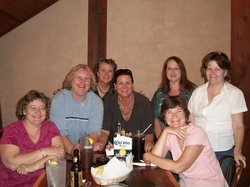 9/15/10 Friends. That's what Ridin' Around is all about. So many friends came to my book launch that we lost count. 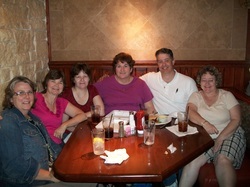 It was fantastic to have that many people in the same room that I knew and considered "friend." From the gal I grew up with and have truly known all my life, to the more recent pals gained in the past few years, it felt GOOD. College cohorts, yoga buddies, motorcycle kindred spirits, folks from previous jobs, college professors, and friends found on the "drag" all came. It was an interesting feeling, like a graduation of sorts. My mom and dad were there in spirit, with her flag and a picture of them both proudly displayed on the welcome table. We had eleven seconds of silence for the victims of 9/11. And we watched the Ridin’ video, calling out the names, whistling at the bathing beauties and cheering for the smoky burnouts. We laughed and had a great time. Friends...yepper. That's what it's all about. roll music was the backdrop for wild antics and the pursuit of having a good time. the joy and pain of young adulthood, and how the friendships formed during those days can last a lifetime. reader can laugh, feel good and perhaps remember great times in their own life. Around is featured in each chapter. The cover art is an appropriate rendition of the theme and time. and can be ordered from any bookstore in America. Videos and original music are posted on . A book launch celebration will be held at Legends Country Club from 2-4 p.m. on Sept. 11. The public is invited to attend. Snacks, music, door prizes and a video slide show will add to the festive event. lover, and horticulturist, she, even after all these years, still drives a fast car and loves to go ridin’ around. Review for The Perfect Place? This book brings to the forefront a longing we all, as temporal beings, carry constantly, yet generally suppress. Then, it journeys to a new frontier, a perfect place that satisfies that yearning. Life and everything on earth is transitory by nature. We face separation due not only to premature death, but due to existing in different centuries, intellectual barriers, physical distance, and the wide gap between the extraordinary/famous and ordinary folks. Imagine a place where none of these limitations exist. Elaine Smith brings you there. Though the story is a mere 40 pages, it is not a quick read. Be prepared to experience a bit at a time, as she weaves together characters, a journey, and endless dialog within a wrapper of human relationships and humor. Come to this work with a notepad and leave behind preconceived notions or any "shoulds" about the content and format of a novel. I found the following line helpful in fully experiencing this book, "...you don't understand things. You just get used to them." The cover art is fabulous and, after reading the book, gave me shivers. Elaine Smith was part of Tarleton in a time when eight-track tapes and driving the drag down Washington was the coolest thing to do. She recently finished her book, "Riding Around, Life, Love, Adventure in a Small Town," of which her editor is now looking at the finished proof. "It was intimate. Everybody recognized everybody. Everybody talked to everybody," Smith said. She explained what dorm life, partying and dating were like during her years at Tarleton in the early '80s. Smith was a resident of Gough Hall. "Nobody locked their doors and very rarely did we shut them," she said. Smith also explained that girls all answered each other's phones. If they needed privacy while on the phone, the cord was long enough for them to go in the closet. The girls also dressed in their closets. She also explained the double standard within the boys' and girls' dormitories. Smith said when a boy came into the girls dorms, he had to leave his student ID and his driver's license at the check in desk. The room that the ID was attached to would be called when visiting hours for boys was over. "It was unheard of for a boy to spend the night in the girls' dorms," Smith said. But it was a completely different story for the boys' dorms. "The boys' dorms were a free-for-all," she said. Smith explained that the girls were snuck in through the fire escape and then through the bathrooms. Smith said it was also a time when the police had a sense of humor. She talked about one instance where some of her guy friends got stopped on the drag and had two high school girls and a bottle of whiskey with them. The officer just laughed and made them pour out the alcohol and sent them on their way. She said there was a different party house for every day of the week, but only one was in Stephenville. "We had to do a lot of driving," Smith said. Smith also fondly talked of some of her friends' antics. She said the boys always had the windows at Bender opened so she, along with her friends, would drive by and yell, "Flesh! Show me some flesh!" and slam on the gas before they did. Smith graduated in 1981 with a Bachelor of Science degree in floriculture and landscaping development. My 50th birthday party with my funny friends. 50th birthday party in August 2011 for Nanci Taylor, aka Tanya in Ridin' Around. Cancer took her from her friends in body alone on 12/13/11. Friends/Characters in Ridin' Around some 30 years later!